What is the most important training camp battle? ASK THE EXPERTS appears weekly from training camp through the Super Bowl with answers to a new question being posted Thursday morning. How the guest experts responded when we asked them: What is the most important battle of training camp? I’m not sure it’s a “battle” so much as something else — a “reckoning,” perhaps? — but we all know some Patriots running back will be very productive this season, and that’s probably the most important unsettled situation in the league. With Sony Michel way behind the other backs both as a rookie and as a result of what is hopefully a minor knee injury, I’m looking elsewhere for now. So the things to watch in the preseason are whether Rex Burkhead seems to have the whole run-some-catch-some job he might have split with Michel otherwise, and also whether Mike Gillislee seems to have edged out of Belichickian purgatory, such that he will (a) make the team at all, and (b) perhaps take goal-line carries away from Burkhead. 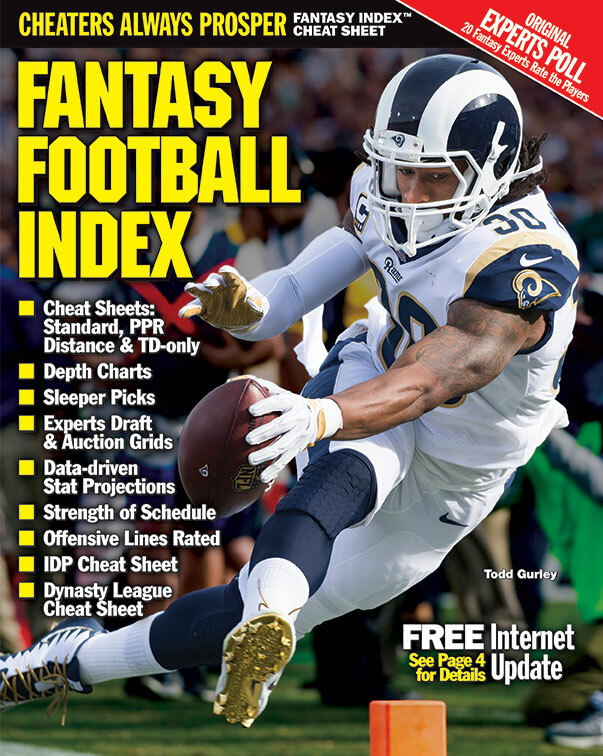 Eleff hosts the Fantasy Index Podcast, available in the iTunes Store now. He has worked for Fantasy Index off and on all century. I don’t think any is more important to fantasy than the fight between Rashaad Penny and Chris Carson for the top backfield job in Seattle. Penny has had fantasy fans since prospect season, drafting him in hopes of getting quick best-ball help. And then, after the Seahawks spent a 1st-round pick on him to ostensibly lead arguably the league’s worst backfield, he shot up draft boards. So many owners already have shares of Penny at 4th-round — or even 3rd-round — prices. Those shares will be in trouble if Carson’s leading the ground work. For those who haven’t drafted yet, it’s simply important for us all to know what to expect from the workload split there so that we can figure out who to pick and when. Seattle went from one of the league’s run-heaviest to last year’s 10th-most pass-heavy. Their actions — drafting Penny, hiring OC Brian Schottenheimer — suggest they want to lean that back the other way. So we should find some running back value to mine … somewhere. Everyone has been heralding the arrival of Jerick McKinnon in San Francisco as though he is a budding superstar. Sorry, I think he is way over-valued right now. ADP wise, he is No. 31 overall and the 15th-ranked running back. When asked why he never really made it in Minnesota, most say it was because of Adrian Peterson’s presence. Better check that again. Peterson was hurt or gone three out of the four years McKinnon has played. Rushing wise, with over 150 carries each year, he averaged 3.4 and 3.8 YPC in 2016 and 2017, respectively. I look for second-year back Matt Breida, who averaged 4.4 YPC in his impressive rookie campaign, to be the primary back and McKinnon to fill his customary role as a 3rd-down back. The outcome of this training camp battle may come as a shock to some who draft McKinnon too high. Mike Nease is a member of the FSWA and has been playing the game since 1985, while also writing about it since 2001. He is a writer for Big Guy Fantasy Sports. Over the years he has sampled about all the playing scenarios that fantasy football offers, including re-drafter, keeper, dynasty, auction, IDP and salary cap leagues. You can contact Mike at mnease23@yahoo.com anytime and during the football season follow him @mikeinsights. There were no real wide receiver battles looming in the weeks before Browns training camp. It was looking like Josh Gordon No. 1, Corey Coleman No. 2, Jarvis Landry in the slot, then controversial rookie Antonio Callaway battling for a backup role. However, the winds of change have been blowing hard in Berea, Ohio. The enigma that is Josh Gordon is still on the outside looking in, working out and rehabbing in Florida. Corey Coleman got exiled to Buffalo. Callaway, "the next man up," gets promoted and then celebrates by getting popped for weed and driving with an expired license on Sunday after practice, and is facing a possible suspension. Other than Landry, are we really looking at Rashard "Hollywood" Higgins as the potential No. 2 wideout in Week 1? Whatever transpires with Cleveland's fluid receiver depth chart in the next couple of weeks, keep an eye toward drafting Duke Johnson in PPR leagues. With two perfect seasons and multiple league championships to his credit, Scott Sachs runs Perfect Season Fantasy Football, featuring live talk and text advice. Scott won the 2011 and 2016 Fantasy Index Experts Auction league, plus he was the winner of the 2012 Fantasy Index Experts Poll. Three choices: MIA WR1, DAL WR1 or IND RB. My vote is the latter. Marlon Mack is the obvious choice as heir apparent (especially after Robert Turbin's 4-game suspension). The interesting part for me are the two rookies Jordan Wilkins and Nyheim Hines. Each brings a different skill set to the backfield and the dreaded RBBC could develop with Colts Head Coach Frank Reich hinting at using the best back on game day. My money is on Mack and I plan on taking advantage of his lower ADP and draft him as a value play in the seventh round. Watch this one closely. I’m most interested to see where the Cleveland backfield ends up. Todd Haley hasn’t used a committee approach much in his time with the Steelers and yet he has three seemingly viable candidates in the backfield. Duke Johnson is likely overdrafted now based on his 74 catches last year when the Browns did not throw downfield and did not have enough good receivers – no longer the case. Nick Chubb was a beast at Georgia and has the chance to translate those elite rushing skills to the Browns. Carlos Hyde is also in the mix after starting for the 49ers the last few years. There is a chance a committee persists even in the new offense, but it would be better if one back clearly deserves to handle a heavy load. I’ll be watching several of the running back competitions that still seem up for grabs as we head into preseason. One for sure is in Green Bay, and understanding what the pecking order and split will be between Jamaal Williams, Ty Montgomery and Aaron Jones. I’ve been moving Williams up my board (RB35 for me now), Montgomery is holding steady as solid depth (RB43) while I’ve dropped Aaron Jones (RB48), as Jones will be handicapped with a two-game suspension though he arguably has the most upside. Green Bay is obviously an attractive offense, and this needs monitoring and evaluation. The running back situations in Denver, Indianapolis and Seattle are also all must-watches here in training camp and preseason. There are a lot of great running back battles. Two NFC West backfields are particularly interesting to me. In Seattle, you've got Chris Carson versus Rashaad Penny. Not a great rushing offense, but whoever wins that job (and it looks like Carson right now) should be featured, and put up some pretty good fantasy production as a runner and occasional receiver. (Their various third-down back options can't be trusted to stay healthy, so one of these guys will also be involved as a receiver.) In San Francisco, I guess it's going to be Jerick McKinnon; he's being paid like it at the very least. But what if Matt Breida clearly outplays him in the preseason? Or maybe even Joe Williams, unlikely though it may seem? Could be a top-20 fantasy back to emerge in August that will be selected very late in fantasy drafts.